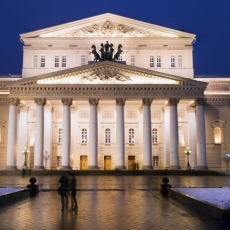 The oldest and, perhaps, one of the most beautiful function convents of Moscow. 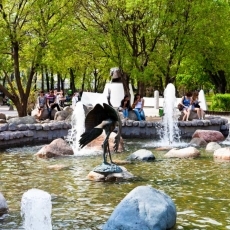 Greatest number of not only tourists, but also local artists came here, to the pond with ducks, looking for inspiration. Mon. - Sun. 09:00 - 17:00. To determine information on opening hours visit an official website. 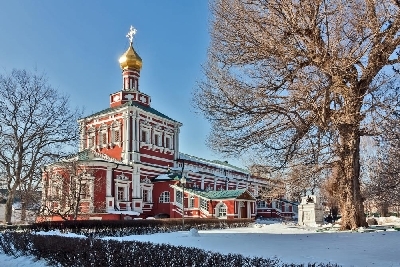 The church is located in the bend of the Moscow River on Samsonov meadow and represents the real fortress - has the impregnable walls, brick towers with loopholes and white-stone finish. 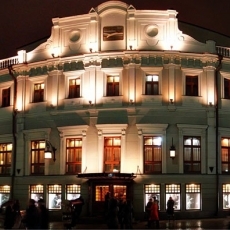 The most part of the buildings was erected in the XVII century in Moscow Baroque Style. 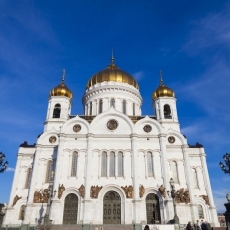 The central part of the convent is the grand Smolensky Cathedral with five cupolas, which preserved in its interiors the frescos of the XVI century and the carved gilded iconostasis by the masters of the Kremlin Armory. 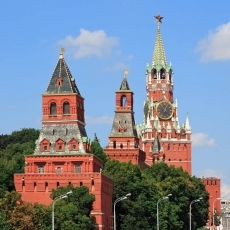 During the reign of Sophia Aleksandrovna the construction of the symmetrical architectural ensemble, which supposed that the cathedral will be the crossing point of two defining axis, began. Along one axis there were two churches (Preobrazhenskaya and Pokrovskaya), along the second axis - the bell-tower and refectory. 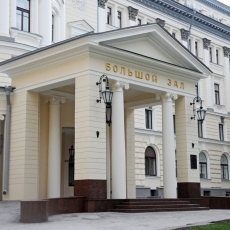 According to the suppositions of the historians, the architect P. Potapov was responsible for the creation of the design and construction process. The bell-tower, which has 6 tiers, was of 72 meters height, and that time, was lower only than the bell-tower of Ivan the Great. The fortress walls with towers were built during the reign of Boris Godunov. All together, there are 12 towers, four of which have a round shape, and other eight - foursquare shape. All these towers are topped with the tracery "crowns". 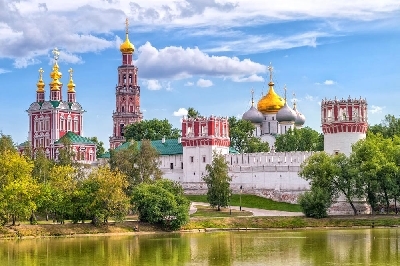 The territory of the Novodevichy Convent embraces 22 buildings and is in the list of UNESCO world heritage. Besides the fact, that the construction was built as a convent, thanks to its good location for the fortification, it was possible to control the crossing over the river and defeat the city boundaries from South-West. 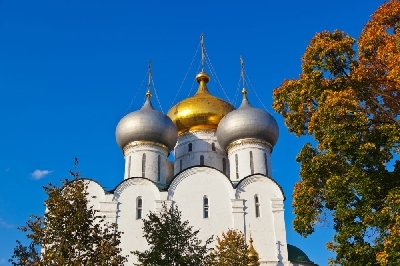 Many key events of the Russian history are connected with the Novodevichy Convent. 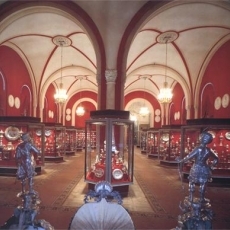 In particular, in Smolensky Cathedral in the end of the XVI century Boris Godunov was elected to the regency. 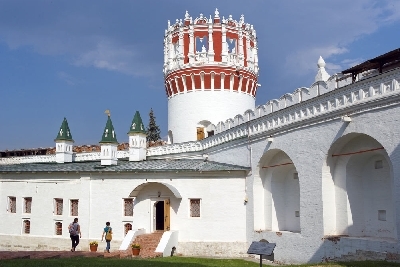 Among other things, the convent was a place, where the most powerful women of different times took the veil, among them - the widow of Vasili IV (Shuyskiy), the daughter of the Tsar Mikhail Feodorovich and the widow of Boris Godunov. 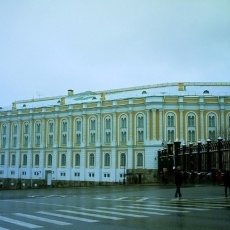 That times, the convent was also a prison, so the daughter of the Emperor Peter the Great Sophia and his wife Evdokia Lopukhina were put into prison here.